Today’s beer comes to us from Israel making it another Asian beer. 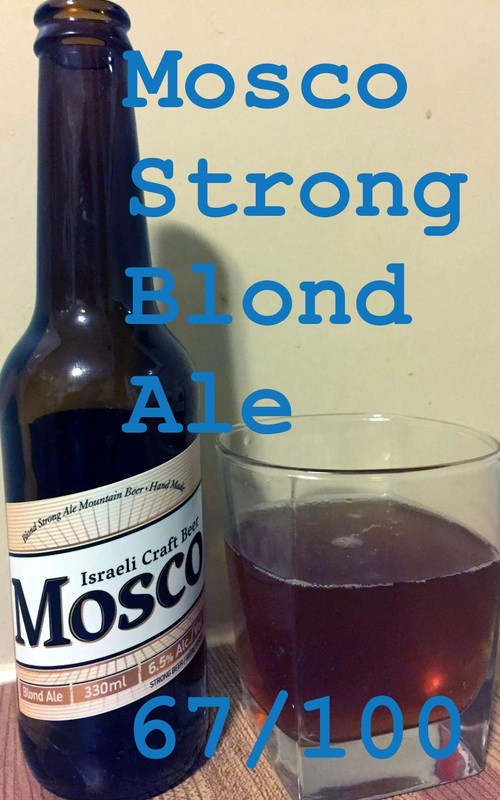 The beer is called Mosco and is brewed in the Judean Mountain in the village of Zanuch in Israel. Annoyingly the website is down for them to update it and so I can’t find any information the brewer or brewery other than its location. Seems that a variety of the beers in the calendar are trying to sabotage my ability to review them. Oh well, we shall just move into the beer style and its review. The beer is a Strong Blonde ale brewed in the Belgian method, so a Beligan Pale Ale essentially. Blonde ales are very pale in color and are usually clear, crisp and dry. Being brewed in the Belgian style means that it will use wheat malts which will make it cloudier than you’d expect but it should still hold the same coloring. Blondes are from the Pale Ale variety of beer and usually have a lighter body with a subdued malt character and large hop profile. They aren’t hoppy by any means, but they typically are not malty either. Think of Coors or Coors light. Onto it then! Appearance: Cloudy with a straw coloring and quite a bit of yeast sediment. Smell: Yeasty on the nose with caramel malts and grassy/lemony notes from the hops. Taste: Cool and crisp with a dry finish. Slight fruitiness with a sickly sweetness making it taste far more alcoholic than the 6.5% abv should account for. Not as crisp as I would expect as the wheat malts make for a creamier mouth feel so the taste is subdued a bit on the end. Mouth feel: Light body with creamy mouth feel with good carbonation. Overall: Not the best Belgian style beer I’ve had in this variety nor even in this calendar. The yeast sediment is a big turnoff for this style of beer as was the overly sweet character to it. Overall this beer was below average for its style and not really a good showing for this calendar. Do I like it: No, I did not enjoy this beer. The sweetness was too much, it didn’t have the body and flavor that I would expect in a Belgian beer. I would not be interested in drinking this one again.